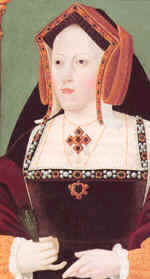 Citation: C N Trueman "Catherine of Aragon and Divorce"
Catherine of Aragon was fully prepared to challenge Henry VIII’s desire for a marriage annulment. Least of all was Catherine willing to go quietly. Catherine was a devout Roman Catholic and to her marriage was a sacred act not to be trivialised in the manner Henry seemed to be doing. Not only was Catherine willing to fight for her marriage, she was also willing to fight for her daughter, Mary, as any annulment might in some way damage Mary’s future. Least of all was Catherine willing to be passive as women were expected to be in Tudor England. Catherine was totally convinced that her marriage to Henry was legal and that Henry’s attempts to prove that his brother Arthur had consummated their short marriage were farcical. She believed that the Pope’s dispensation proved that the marriage to Henry was legal, as it had been sanctioned by the highest religious authority on Earth (for a Catholic). Catherine became a very active resistor against an annulment – much to the surprise of Henry who had expected her not to support it but to be very much passive in her approach. There can be little doubt why Catherine took this stand. She was a devout Roman Catholic with all that this meant with regards to the sanctity of marriage. But Catherine was more than this. She also believed that she had been a very good wife to Henry, fulfilling all her duties as queen and turning a discreet eye to his indiscretions. Catherine believed that natural justice meant that she should be allowed to continue in this role. Catherine wrote a steady string of letters to the Pope, Clement VII, and to Charles V explaining her stance and asking that they back her. There is little doubt that she had the support of many of the public who saw her as being virtuous – the opposite of what many thought of Anne Boleyn. Catherine also made a very personal plea to Henry in 1529 when she got down on her knees and begged him not to go ahead with the annulment. Witnesses to the scene claimed that Henry was nonplussed by what she had done. As she left the chamber where the king was, she was ordered to return but did not. It was later stated, that as a loyal queen and wife she was angered by her own actions as she had disobeyed her husband – something she found hard to understand. Catherine told her counsellors that she had never disobeyed her husband before and that she regretted doing so in 1529. Despite her objections to an annulment, Catherine never said or wrote anything from 1529 to 1533 that was openly critical of Henry. When one of Charles V’s representatives (Eustace Chapuys) tried to persuade her that her popularity was such that a successful rebellion against Henry could be organised, she would have nothing to do with it. In fact, she wrote Charles personally to instruct him to ignore the advice of Chapuys. After the annulment was pushed through, Henry ordered that Catherine should have the title Dowager Duchess of Wales.